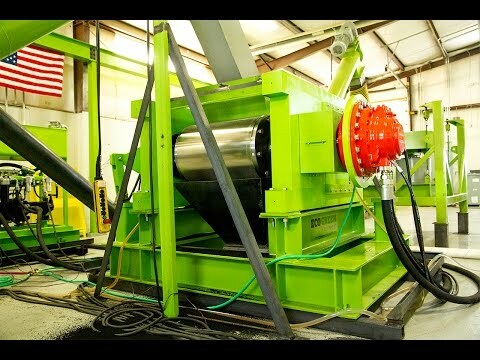 The final stage of the tire recycling process is the rubber powder system. Take your crumb rubber down to fine rubber. This fourth stage of tire recycling provides clean, contaminant-free rubber powder…up to 177 microns (0.177 mm) in size. This system provides reliability and operational savings for processors demanding commercial quantities of rubber powder. Come see us for a demonstration of our ECO Rubber Powder System…you will be impressed with the quality of output! The ECO rubber powder system is designed to process wire-free crumb rubber up to 19 mm (3/4” inch minus in size) down to 841 to 177 microns (0.85 mm to 0.177 mm) granules for output or further processing. ECO RP system features the ECO Krumbuster® fine grinding mill. This patented machine cuts, grinds, screens, and re-circulates feedstock material until the desired size is achieved. This process results in clean uncontaminated rubber powder. The ECO Rubber Powder system was designed as a stand-alone station operation or configured with accessory connecting equipment for re-circulation and screening capabilities in a larger plant setting. This state-of-the-art cutting technology returns low wear costs and easily adapts to new or existing tire recycling systems. Take a closer look at an ECO Rubber Powder system at work. The ECO RP-KB-1.5-850 system is proven to convert wire-free crumb rubber into high quality, uncontaminated rubber powder. Uniquely designed to process crumb rubber, the ECO RP system grinds as small as 841 to 177 microns (0.85 mm to 0.177 mm) in size. During this process, the crumb rubber granulates are cut and potentially re-circulated, leaving a clean, uniform rubber powder for secondary products and uses. An ECO Rubber Powder system is your best solution for clean rubber powder! Ideal for processors demanding high commercial output of rubber powder for secondary uses such as asphalt, molded goods, and automobile parts. Contact us today to learn more about our Rubber Powder systems for scrap tire processing. The ECO RP-KB-1.5-850 system features the ability to process wire-free crumb rubber from car, truck, and semi OTR tires. Many are looking for more effective ways to process other waste and materials with the ECO RP systems. We are currently researching and developing ways to accomplish this with materials such as wood, plastics, and municipal solid waste (MSW). Depending on the required output, ECO RP systems can process challenging items at efficient rates. Contact an ECO Green Equipment Representative for more information about this powerful and cost effective machine for your operation. Check out the ECO Rubber Powder system cutting crumb rubber into powder! Schedule a visit to see this system in action!